Mother, on the other hand, lightly rests the fingers of her left hand on the edge of the table and sits perfectly erect, with her head held high and scarcely so much as a glance at the plate. She darts the spoon into the soup and like a swallow — so gracefully and cleanly one can really use the simile — brings the spoon to her mouth at a right angle, and pours the soup between her lips from the point. Then, with innocent glances around her, she flutters the spoon exactly like a little wing, never spilling a drop of soup or making the least sound of sipping or clinking the plate. This may not be the way of eating soup that etiquette dictates, but to me it is most appealing and somehow really genuine. As a matter of fact, it is amazing how much better soup tastes when you eat it as Mother does, sitting serenely erect, than when you look down into it. But being, in Naoji’s words, a high-class beggar and unable to eat with Mother’s effortless ease, I bend over the plate in the gloomy fashion prescribed by proper etiquette. From the moment I read that, I knew that this was the book for me. You know, it’s interesting to contemplate the Japanese novel. 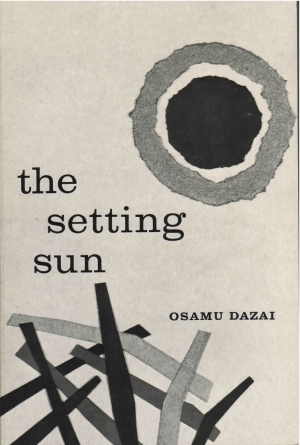 From what I can tell, Japanese novelists are very much in conversation with western ones: Junichiro Tanizaki and Natsume Soeseki had both read tons of western novels. But Japan also has its own independent novel tradition: Tale of Genji is considered (by some) to be the first novel. And both Japan and China were producing high-quality works of prose fiction long before the West (okay fine, the West did have Petronius and those ancient Greek novelists, but whatever. No one reads them). And one can certainly detect some significant structural differences between the Japanese novels that I have read and what I would consider the standard Western novel. Japanese novels tend to be a slower and to have conflicts that are less pronounced. Tension doesn’t rise in as straightforward a manner. And while they often end on images, those images don’t usually feel like epiphanic moments. Of course that’s by no means true for all (or perhaps even most) of them. Tanizaki’s Quicksand, which I read a week or two ago, has a fairly straightforward crime novel structure: it’s full of plotting and reversals and ends in a stunning twist. Anyway, I suppose this’ll all become clearer to me as I read more of them. What blogs should I subscribe to?